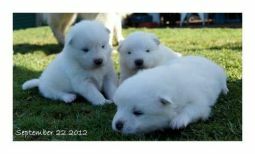 Samoyed breeders links and breed information on pups4sale.com.au. pups4sale testimonial: Thanks so much! I have sold all my puppies, so I don't need to renew the ad...Was the best thing I've done.2 of them are even going to Sydney...your web its great! Next time I will do it again. Hope you have a great Xmas! The Samoyed, known as the "smiling dog," is a strong and beautiful breed originally bred to be working dogs. What makes the Samoyed especially popular is that it is both strong and hard working, while also being a great family pet. They may look like small dogs, but Samoyeds are as strong as many of the medium breeds, which is why they used to be sled dogs. 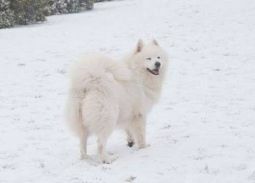 Thanks to Vonleenard Samoyeds for the pictures of Samoyed puppies & adults used on this page, and the additional information provided. Samoyeds are small medium-sized dogs that have a very muscular frame. This muscle is hidden by the thick coats that they have, but owners quickly find out just how powerful these little pups are. 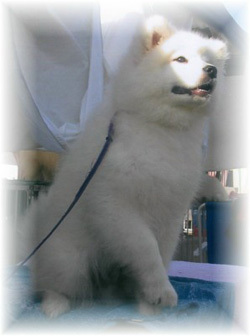 Male Samoyeds will grow to be just under two feet tall and weigh just about 60 pounds. Females are quite a bit smaller, growing to about 20 inches tall and weighing between 38 and 50 pounds. A distinctive characteristic of the Samoyed is that they have thin black lips that curve up into what looks like a permanent smile. These are happy dogs, so the “smile” is often fitting to their actual mood. They also have a thick, curled tail that actually curls back toward their body and settles on their back. Even when a Samoyed's tail is wagging, it continues to face toward its head. Samoyeds have a thick double coat that they will shed either twice or three times a year. The undercoat is thick and soft, while the overcoat sticks straight out. 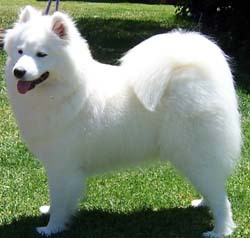 Samoyeds are most commonly white, but they can also come with a variety of off white and biscuit colors. Samoyeds are extremely friendly, which means that they are great for big families or for people who have a lot of guests over. It is very rare for a Samoyed to bite, but they will bark a lot when they need something or they sense that something is wrong. The Samoyed bark is quite popular because they can reach several octaves and can sometimes sound like they are speaking rather than barking. It's important that they learn to control their barking early on because it can be annoying to owners and to their neighbors. Samoyed puppies need to be taught early on in their lives that sometimes they will have to be left alone. Otherwise, they can quickly become anxious when they are separated from their owners and will bark and chew incessantly. They are smart even as young pups, so owners should be prepared for a sneaky puppy. There aren't too many breeds in the world that are better than the Samoyeds are with children. They love to play all day long, so kids of all ages usually enjoy this breed. However, they will play a bit rough at times, so it's important that parents keep their eye on their kids when they are playing with Samoyeds. Samoyeds like people much more than they like other dogs, but this doesn't mean that they can't be socialized. They just need to be socialized as puppies and taught not to attempt to herd other animals. The fact that Samoyeds aren't aggressive at all makes them very poor guard dogs, but they are pretty good watch dogs because of their tendency to bark. Smart dogs that are very independent minded are always a bit harder to train, which is certainly the case with Samoyeds. However, owners who are willing to show patience and to do a bit more training with their dogs will find that it is very rewarding once a Samoyed figures out what he or she is supposed to be learning. Training Samoyeds has to go beyond basic commands because they like to bark, are prone to pull things, and are a bit wild in the house if they don't learn otherwise early on in their lives. Potential owners need to keep this mind before they choose to get a Samoyed because they can make life very difficult for their owners if they aren't trained early and often. Teaching a Samoyed to go on walks correctly can take a bit more time than it does with other breeds. They were originally bred to be sled dogs, so it is in their nature to pull a leash rather than walk next to their owners. Extra time should be taken during training sessions to teach a Samoyed how to go on walks the right way. Most people who get Samoyeds know that this is a hard working dog, so it's the type that needs a lot of exercise. What they may not know is that this breed has no problem using all of its pent up energy inside of the house if it doesn't get its required exercise outside. This is okay sometimes if they are running around with the family in a big, open room, but it can become a problem if they start knocking things over in the house. To keep a Samoyed from getting bored and running all over the house, they should be walked and run at least once per day. This breed can run for a long time, so they are a great fit for people who jog daily. It's just important that they know who is in charge so they don't try to pull the person who is walking them. Samoyeds need to be brushed once a week to prevent matting and to keep their dead hairs from ending up all over the house. They are generally very calm when getting brushed, so the process is easier with them than it is with some other long-haired breeds. Samoyeds are known for not carrying a bad dog odor. In fact, many Samoyed owners agree that this breed actually naturally smells good most of the time. They also aren't the type of dog to get dirty very often, so a bath every three or so months is just fine for this breed. Pretty much every other grooming need is going to be the same for the Samoyed as it is with every other breed. Their nails should be trimmed every other week or when needed, their teeth should be brushed regularly, and their ears should be checked once or twice a week to make sure that they don't get infected. Diabetes is the most common predisposed disease that this breed deals with, but if it is caught early, it is not something that will shorten the dog's life. However, if untreated, diabetes can lead to blindness and other serious health issues. Samoyeds live pretty long lives because they are usually healthy animals and aren't as prone to many of the most common health issues. They usually live to be between 13 and 15 years, but it is not uncommon for them to live a bit longer than that. 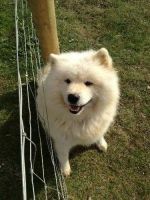 Individuals and families with a lot of energy would be great fits for Samoyeds because they like to have people around them who can keep up with them. The more energetic the person, the easier it is for this breed to bond with their humans. The best fit for a Samoyed is when someone is always home, so it would be great if there is a stay at home mom or dad or someone else who can play with the dog during the day. This isn't absolutely necessary, but this breed can become quite anxious when left alone for too long. Samoyeds love attention from as many people as they can get it from, so this is one of those breeds that works better in big families than with single individuals. Of course, they can live happy lives with just one person as long as they are trained the right way and get the attention that they need. Dog breeds like the Samoyed just look like they'd be the perfect fit for anyone looking to get a new dog, but Samoyeds definitely need a specific type of owner. For example, people who prefer dogs that are calm all of the time and don't need to get outside too much are definitely not good matches. Samoyeds don't necessarily need an owner who has trained a bunch of dogs in the past, but they do need an owner who knows how to train this breed and has the patience to pull it off. This is an intelligent breed, which means that they can learn many commands, but they will also try to outsmart their owners until they realize who is in charge. The smiling Samoyed is an ancient breed for a reason: they love to work hard for their owners and it's very rare that people don't get along with this breed. While they may be a bit tougher to train than some other breeds out there, they also reward the hard work of their owners in the long run by being a more complete dog. It's true that the Samoyed isn't the perfect fit for everyone, but those who can match this breed's needs will find out why people have been loving the smiling Sammy for centuries.